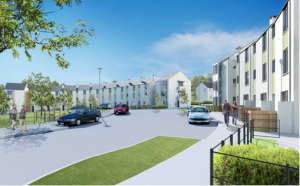 The construction of this new residential development began in July 2008 in Mallow, Co. Cork. This project consists of the provision of 213 residential units comprising of 189 houses and 24 apartments. These units have all been designed to meet high energy efficient standards incorporating natural lighting, high-efficiency windows and insulation in walls, ceilings and floors.The 7 hectare development also includes the construction of a Creche / Community Hall, football pitches and children’s play grounds and is due to be completed in 2011.